Military experience is an outstanding resume-builder if you know how to sell it, but everyone’s looking for that extra edge — something they can back up with certificates and credentials. One option for sailors and Marines (and the Coast Guard) is the United Services Military Apprenticeship Program (USMAP), a partnership between the US Department of Labor (DOL) and the military that lets service members use their on-duty experience to earn journeyman status in a trade. Here’s an example that could work: As a career planner in the Marine Corps, Joe was also assigned as the command’s local photographer for portraits and public relations shots. With some creative thinking and some off-duty education, Joe might have got himself an apprenticeship in photography normally only available to combat camera operators. The downside? Since USMAP only allows one apprenticeship at a time, he'd have gambled away his shot at a human resources certificate relevant to his actual MOS. Musicians (MU/5500) and air traffic controllers (AC/7200) in either branch. In the Navy, there are no USMAP apprenticeships for Interpretive Cryptologic Technicians (CTI) or Navy Divers (ND). In the Marines, Infantry (0300), Training (0900), Tank and Amphibious Assault Vehicles Operators (1800), Linguists (2700), Chemical/Biological/Radioactive/Nuclear Technicians (5700), and Flight Crews (7300) have no journeyman equivalent. 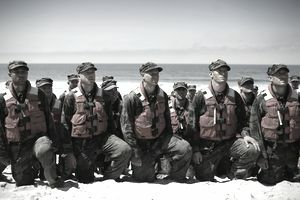 Special Warfare Operators (SO) -- aka Navy Seals -- are actually eligible, at grade E-7 and above, for an apprenticeship as a Master Homeland Security Specialist if they’re officially assigned the Navy Enlisted Classification Code (NEC) for Disaster Preparedness Operations and Training Specialist (9598) or Anti-Terrorism Training Supervisor Instructor (9501). The Marine Corps’ artillery occupational field (0800) actually has a few journeyman equivalents: Cannoneers (0811) can apprentice as government service ordnance artificers, Fire Controllers (0844) as surveyor assistants, and Sensor Support Techs (0847) as weather observers. USMAP claims that it “requires no off-duty hours,” but you do need to log 144 hours of formal training for every 2,000 hours (about a year) of apprenticeship work. Fortunately, formal military training for your job can knock a lot of that out in the beginning, and even relevant correspondence courses such as those offered by the Marine Corps Institute (which can also boost promotion potential) count toward the requirement. The worst-case scenario is, of course, having to take off-duty courses using tuition assistance or the GI Bill. But a little education never hurt anyone. There’s a conspicuous lack of information out there regarding apprenticeship programs for the Army, although a program has popped up in the past few years to help soldiers in the Army Reserve and National Guard. Under the Post-9/11 GI Bill, veterans may also be eligible for payments to support vocational, technical, and on-the-job training. However, these (with the exception of GAPI) are not military-sponsored programs and are not necessarily apprenticeships. To become a journeyman this way, you’d still have to seek out, apply for, and gain acceptance to an apprenticeship program sponsored by a civilian employer that incorporates vocational training approved for GI Bill payments. Unfortunately, working a civilian apprenticeship opens up the possibility of being paid less than minimum wage, not to mention working outside the uniquely supportive environment of the military.